Rajasthan Public Service Commission RPSC Released Total Number Of 5,134 (5,000+134) School Lecturer Vacancies for the Waiting Ones. Apply for 134 RPSC 1st Grade Teacher Recruitment from 29th March 2018 To 17th may 2018. Apply through RPSC @ rpsc.rajasthan.gov.in Online for & Again, RPSC invites the School Lecturer/01st Grade Teacher Recruitment for 5,000 Posts which will be Activated from 17th may 2018 To 09th June 2018. RPSC School Lecturer Online Application for134 Posts. Hello to the job seekers. Are you wish to apply for the Rajasthan state government jobs. If yes, one good news was waiting for you. This information was also helped in the job searching purpose. The RPSC School Lecturer Recruitment 2018 was delivered by the organization of Rajasthan Public Service Commission. For more information refer our site @ recruitmentindia.in regularly. In RPSC School Lecturer Recruitment was released the 5,000+134 1st Grade/ School Lecturer Posts to work in the various departments. A huge number of candidates are willing to apply for these RPSC School Lecturer vacancies. The RPSC School Lecturer Online Application Link active from 20th April 2018 To 09th may 2018. The application process was started on 20 April 2018 and the application process was ended on 09 May 2018. Utilize Rajasthan PSC 134 School Lecturer Vacancies In 2018: Contenders check this latest employment opportunity. In coming days the registration process was available. So candidates check the details on this page for the further information about the RPSC School Lecturer Bharti Notification. Interested applicants, enroll their names in the Rajasthan Public Service Commission from 20th April 2018.. & for 5,000 posts Candidates have to check the RPSc lecturer Online form will be released from 17th may 2018 To 07th June 2018. In the registration time, you make any mistake in the application process, the board RPSC also gives the chance to correct or edit the RPSC 1st Grade Teacher Application Form. The application form correction was available on 10 May to 16 May 2018. So candidates carefully remember the mentioned dates. Because these dates are important to follow the RPSC School Lecturer Recruitment 2018. Contenders, also refer Previous Papers on this page. Aspirants should complete their graduation + B.Ed in recognized university/ institution or relevant course. The RPSC School Lecturer Recruitment 2018, the age limit was mentioned on the below page. The RPSC School Lecturer Recruitment 2018 selection process was based on the online written test. For eligible candidates get Rs.9300 –Rs 34800/- per month. Catch RPSC School Lecturer Bharti Online Form @ rpsc.rajasthan.gov.in: Claimants, who have completed their graduation along with B.Ed, those candidates are eligible for these vacancies. The RPSC School Lecturer Recruitment 2018 selection process was based on the written test. The written test is the first step in the selection process. So application employed individuals can obtain the apropos exam Syllabus on this page. If you have any confusion about the Procedure Online Form filling of RPSC School Lecturer Bharti follow the applying instructions on the bottom of the page. First, Visit the official website for @ rpsc.rajasthan.gov.in and then Open the link. 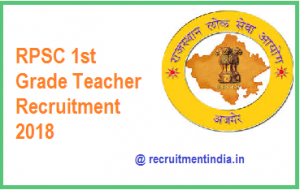 Check RPSC 1st Grade Teacher Application Form 2018. Enter the candidate required details on the application form. Enclosed the necessary Documents in the Pdf format. Pay the fee as per the norms of the Job opportunity Then, Submit the application form after completing the filling process.